strengthMuscle strength and power that takes place in Flag Football, that is, helps you develop both brute force compared with other physical activities or sports. 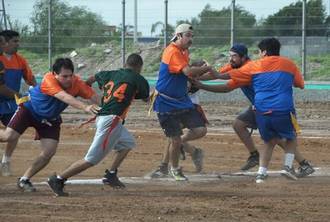 EnduranceCardiovascular endurance constantly providing Flag Football practice, that is, how much help you cope ejercitándote long compared to other sports or physical activities. AgilityAbility to move the body as desired quickly and accurately obtained by practicing Flag Football, constantly compared to other physical activities or sports. ReflexesAutomatic responsiveness to stimuli is achieved spontaneous Flag Football, practice compared to other sport or physical activity. AccuracyHow much will dominate specific body movements to achieve the same result to practice Flag Football, compared to other sports or physical activities. 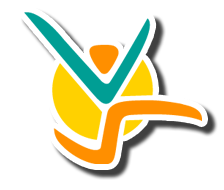 BalanceBoth are able to control the body's muscles to prevent the imbalance by making Flag Football unlike other sports or physical activities. ConcentrationThe ability to focus mind and senses intention to achieve a specific goal that is acquired by practicing Flag Football, compared to other sports or physical activities. ToningStylization of the body and muscle derarrollo pruduct of optimal levels of body fat that comes from Flag Football, compared to other sports. Calorie BurningThat many calories are burned while practicing Flag Football, when compared to other sports or physical activities. 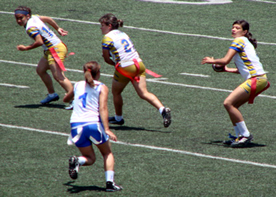 Derived from football that involves some of the virtues of this, such as teamwork, practicing offensive and defensive plays to beat the contrary developing skills, tactics and techniques. 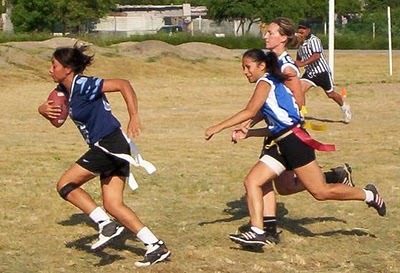 It is a sport of skill that requires its participants to run, throw and catch the ball regardless of their position in the field as all participants are eligible. It is not valid to hit. There are tournaments that are mostly feminine, in Mexico there is a link called AJFAFAC, which is the American Youth Soccer Association Women's AC. Teams of this association have gone to play USA and Europe. American football has been practiced since long ago in U.S. since about 1850 (the first official game of college football occurred between the universities of Princeton and Rutgers on November 6, 1869), and as the origins of "flag football "dating from about 1900 to become increasingly popular, young amateur playing in the streets of the U.S. but when played on a hard surface and not having adequate protection, changed the game for a scarf attached on his pants and this to be removed by an opponent was seen as the end of the play. It is played between two teams of no more than 7 players each in the field of play and will wear a belt with three strips of 40 cm. long and 6 cm. wide, one on each side of the waist and one in the back. The game will be played under the supervision of three officials (referees). The playing field is a rectangular area 80 yards long by 53 wide, and two end zones of 10 yd. each, which will be the end zones, the field will be marked along every 20 d. by perpendicular lines which cross it completely, the width of the field will be divided into three parts, the two external are 20 yd. Central 13 where the ball will be placed at the beginning of each play, these lines mark the field throughout, will be marked two crosses in each of the 25-yard kickoff for brands and 3 yards and 8 each side for extra point attempts, the area where the bank will be located on the outside of the field from 20 yards on each side. Will be considered illegal equipment: long nails, earrings, chokers, bracelets, watches, sunglasses (only with clips) and gum, if this is detected during the game will be charged a timeout to the offending team. 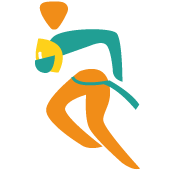 The caps, towels, wristbands, gloves or similar will have the effect of the belt only if they touch the ground after falling but cannot be snatched. It will not be allowed to block, this is the interposition of a player from his companion in possession and the possibility of defensive tackle and is punishable by 5 yds. The loose ball or fumble does not exist, when the ball touches the ground the play is killed. Tackle the belt to remove the player in possession of the ball, if it already did not have the belt is valid touch the shoulders to the knees in any body part. The playing time is 48 minutes of actual play, which is divided into quarters of 12 min. each with an intermediate of 1 min. Between each quarter and 10-minute break between the second and third quarters. Each half will start with a kick of Kick-off in the yard 25. Each team will have three timeouts per half and subtract two minutes in the second and fourth quarters, the officer shall notify the coaches of each team and these may take a minute of time out extra. Annotations are: Touchdown-6 points; Safety -2 points, Extra Point by kicking or play-yard 3 to 1 point and yard 8-2 points Field Goal points and -3 points. Did you know... ...babies can learn to swim and hold their breath in the water?